In July 2014, I joined Tulane University as an assistant professor in the Department of Cell and Molecular Biology. My research interests are in all things vascular including, blood vessel patterning and morphogenesis, anastomosis and arteriovenous malformations. Prior to arriving in New Orleans, I trained as a postdoctoral fellow and Instructor in the laboratory of Dr. Ondine Cleaver at UT Southwestern Medical Center in Dallas (2008-2014). Using mouse genetic models, my studies focused on understanding the role of repulsive guidance cues, such as Semaphorin 3E, in blood vessel patterning and morphogenesis. UTSW was also where I started many of the projects that will drive my lab at Tulane, thanks to Ondine's mentorship and support. Before my postdoctoral studies, I was a graduate student in the laboratory of Dr. Paul Krieg at the University of Arizona in Tuscon (2001-2008). Using the frog (Xenopus laevis) as a model system, my work centered on understanding the transcriptional programs regulating skeletal muscle and vascular gene expression during embryogenesis. The desert is where I first became interested in vascular biology. I received my BS degree in Biology at the University of New Mexico (University near Mom) in 2000. During my time there, I conducted research as an undergraduate student and technician (2000-2001) in the laboratory of Dr. Richard Cripps. One could say that is where I caught the research bug and never looked back. Favorite place at Tulane: Crawfest! Angela Crist is a 4th year PhD student in the Meadows Lab. She is originally from Jacksonville, FL and like any Florida girl, loves the sunshine and beach. Angela received her Bachelors of Science degree from the University of North Florida where she studied coastal biology. While there she interned at Mayo Clinic in Dr. John (Al) Copland’s lab. It was in this cancer biology lab that she discovered her love of research and decided to pursue research as a career. When she’s not in the lab she enjoys hiking with her dog, Dixie, and reading books. Traveling is a hobby when she can afford it. She has won many poster awards at scientific conferences in addition to being the 2017 Cell and Molecular Biology Apple Bobbing Champion. Hailing from Kansas, Dawn brings her midwestern charm to the lab, joining as a graduate student in 2017. Dawn is our resident Applebee's informant, as it is her favorite restaurant and second home. She also harbors a small menagerie in her 1 bedroom apartment, offering a home to 4 cats and 1 dog. Nehal is from Kenya, the land of big five and cradle of humanity. 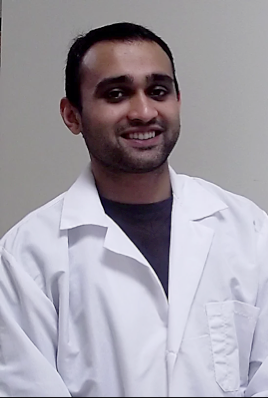 Nehal earned his Bachelor degree in Biotechnology from St. Cloud State University, St. Cloud, Minnesota. Following his undergraduate degree, he worked at Boston Scientific as a research technician. This experience sparked his enthusiasm for science and research, and thus decided to pursue graduate school. He earned a Master’s degree in Molecular Science and Nanotechnology from Louisiana Tech University, Ruston, LA. He then joined the Meadows Lab in 2017 to start his PhD in Cell and Molecular Biology at Tulane. His research in Meadow’s lab focuses on understanding the molecular mechanism that regulate angiogenesis in normal and diseased state such as arteriovenous malformations. In his free time, he enjoys playing and watching sports, being outdoors, and trying out new food recipes. Xingyan (Cheyenne) is from China. Xingyan discovered a passion for research during her Master’s studies at China Medical University. She decided to pursue a Ph.D. degree at Tulane University and joined the Meadows Lab in 2018. Cheyenne is obsessed with bench work, and gathering and analyzing data in the lab. In her leisure time, she and her husband enjoy exploring great restaurants and attractions throughout New Orleans. Kelsey left her home state of Mississippi to join the Meadows lab in 2017. Kelsey received her Bachelor of Science degree from the University of Southern Mississippi. While studying as an undergraduate student she joined an entomology lab where she discovered her love for research. She received her Master of Science in Medical Sciences from Mississippi College and joined the Meadows lab as a lab technician shortly after graduating. Outside of the lab, Kelsey enjoys playing video games, exploring New Orleans and spending time with her dog. Avery is the newest addition to the Meadows lab as a Lab Tech. Avery is from Jackson Michigan, and later graduated from the University of Michigan with a bachelors degree in biochemistry. Beyond his passion for science Avery enjoys learning about art and world history, hence a minor in Art History. In his free time Avery enjoys cooking food, eating food, and playing video games. Josh, hailing from Scottsdale, Arizona, is the Meadows Lab's second undergraduate researcher ever and the lab's most aggressive bowler, nicknamed "the Hulk". He is pursuing a Bachelor of Science in Cell and Molecular Biology with a double major in Spanish at Tulane. His consistent interest in biological research led him to join the Meadows Lab. Other research experiences include clinical cancer research at the Mayo Clinic and neurogenomics research at the Translational Genomics Research Institute. Josh will also be the first MD from the Meadows Lab! After graduating from Tulane in the Spring of 2018, he will be a part of the medical school class of 2022 and then will be formally known as "Dr. Hulk". In his spare time, Josh enjoys traveling, skiing, and playing the piano. Hannah is originally from breaux bridge Louisiana and is the Meadows Lab resident class clown. After graduating from Tulane in 2018, she will be bringing her jokes to the LSU Dental School in New Orleans. In addition to her major in Cell and Molecular Biology, she is also a dance major and frequently expresses herself in the lab via interpretive dance. Hannah loves spending time with friends and doing arts and crafts when she has time. Occasionally she assumes the persona of "Bruce", who will invest your arcade credits wisely. All the way from Connecticut, Amanda and her bright pink hair will blaze through the Meadows Lab for all four years of her undergraduate degree, being the first undergraduate to do so. She is double majoring in Cell and Molecular Biology and music and marches in Tulane's Marching Band as a flute player. She was the 2017 Munch Master, winning the first annual Cell and Molecular Biology Munchie Madness cooking competition, beating out 15 other CMB contestants.